Are you ready to try some of the best milk in the world? Our milk is fresh from our pasture-raised, grass-fed Jersey cows, without any homogenization or pasteurization. This allows you to enjoy the true flavor and health benefits of real milk. Our milk is bottled to ensure the freshest product. Visitors are welcome to come out and see the cows grazing in thick pastures and pet a calf! We are one of a handful of dairies in the state of Texas that has obtained a “Grade A Raw for Retail Milk Permit” issued by the Texas Department of State Health Services. 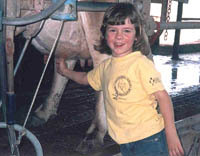 We obtained this special permit in 2005 and we gave been producing wonderful raw milk for our customers ever since. This special permit is stricter in its criteria than a regular state health permit for producer dairies shipping to pasteurizing milk plants. We take pride in the fact that Stryk Dairy has maintained Grade A status since the 1950′s and we have cow families that trace back to when Bob’s father began the family farm. To inquire about any of our fresh milk or cheese products call us at 979-561-8468. Raw milk products are not available for shipping. Stryk Dairy Farm and Strykly Texas Cheese. All Rights Reserved.